Today was a day off, because the Lao National Day fell on a Sunday. It was very welcome time off, which I spent writing and puttering around the house. I tried to figure out where to plant my new rose buses, finally deciding to drop them off at the front of the house. I took a long bicycle ride today, just to see what's changed since the last time I did this, a month ago. Well, the weather always changes. It's cold season, and the clouds hover close to the ground. 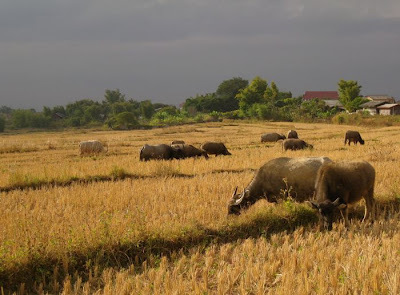 This picture of water buffalo grazing in the stubble of the rice fields turned out very strange - but the colors were very strange, the sunlight just leaking through to light up the foreground, while the background remained ominous looking.